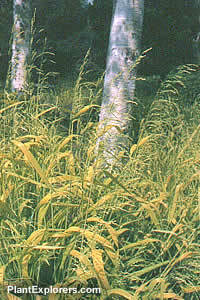 Most grasses, and grass-like plants require full sun, but this grass is the exception to the rule. The bonus is that the delicate chartreuse leaves will brighten a shady corner in any modern grass garden - or any garden. For maximum freshness, please keep seed refrigerated in its original packaging until it is time to plant. Sow seed in containers in spring or fall. Grow on in any moderately good garden soil with good drainage. Best grown in partial shade, although it can take full shade. Self-seeds freely.